The Series 2900 Current to Pressure Transducer delivers reliable high performance for the toughest applications in the most hazardous environments. Its NEMA 4X housing is designed and FM and CSA approved for both intrinsically safe and explosion-proof operation. This unit has advanced circuitry which includes electronic feedback control for superior vibration protection and highly accurate output. The 2900 is not position sensitive and the easily accessible zero and span adjustment make field calibration quick and easy. For ease of installation, this model has input and output ports on both the front and back. 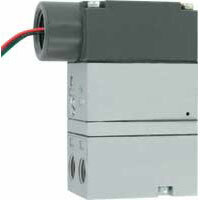 It is also not vibration sensitive, which makes the 2900 ideal for field mounting on a valve. These features coupled with the unit's compact size help make set-up and installation simple. Oil free, clean dry air filtered to 40 microns. Minimum: 5 psig (0.3 bar) above maximum output; Maximum: 100 psig (6.9 bar). 3 to 15 psig (0.2 to 1.0 bar), 6 to 30 psig (0.4 to 2.1 bar). Operating: -40 to 160°F (-40 to 71°C); Storage: -40 to 200°F (-40 to 93°C). 0.05 scfm (0.02 l/s) at midrange typical. 4.5 scfm (2.1 l/s) at 25 psig (1.7 bar) supply; 12.0 scfm (5.7 l/s) at 100 psig (6.9 bar) supply. Chromate-treated aluminum with epoxy paint. 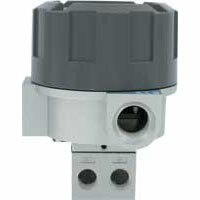 Weatherproof NEMA 4X (IP65), explosion-proof and intrinsically safe. Explosion-proof for Class I, Division 1, Groups B, C and D. T6, Dust Ignition-proof for Class I, Division 1, Groups E, F and G, T6; Intrinsically safe for Class I, II and III, Division 1, Groups C, D, E, F and G, T4 hazardous (classified) locations and intrinsically safe for Class I, Zone 0, Group IIB, T4 hazardous (classified) locations and suitable for Class I, Groups A, B, C, D, T4 and Class II and III, Division 2, Groups F and G, T6 hazardous (classified) locations. Class I, Division 1, Groups B, C and D; Class I, Division 2, Groups A, B, C and D; Class II, Division 1, Groups E, F and G; Class II and III, Division 2, Groups F and G.
Valve Mount: For factory mounting and calibration to Hi-Flow™ control valves, add Current-to-Pressure Transducer model number as suffix.